I read with great interest the post by Grant McCracken that addresses the "brief" moment in the sun for creative types. Grant's concern is that crowdsourcing will allow corporations to source design skills, ideas and other creative concepts from the internet, rather than turning to creative design organizations. In this, he is probably right. There's a growing awareness that there are good ideas "out there" if we can only tap them. You need look no further than Dell's IdeaStorm or BestBuy's Idea Exchange for proof. Currently you can create a campaign or contest to design a new logo. Chuck Frey's new logo at Innovation Tools was designed in a contest, and he allowed many of his readers to vote on the designs they liked best. What I'm having a hard time with is that the concerns McCracken raises are misplaced in my opinion. Yes, there are thousands of creative types working in their homes and hundreds of thousands of people who have good ideas for Dell, and for BestBuy. And who could provide ideas to firms that really need them, like General Motors, or the Federal Government. But I digress. All we've done with crowdsourcing is leverage the internet to capture the ideas these individuals have always had. The internet has simply provided a marketplace for us to exchange our skills with willing buyers, whether those skills are design skills, or ideation skills, or photography skills in the case of Flickr and other photography sites. While this is happening, this doesn't portend the end of creative design firms or innovation teams in businesses. Here's why. I can crowdsource ideas, or designs, once I've had the insight into key problems or opportunities. Only when I, the requester of ideas or designs, have identified the opportunities, established the context and strategy, and determined how to implement the idea or design, do I even need the "Crowd". We never felt threatened when we asked people to help us in a brainstorming setting, so why should we feel threatened when the brainstorming session gets significantly larger? We don't hold a lock on ideas or concepts - no one does. Perhaps some people or firms are better at generating ideas or concepts than others, but that's only on the margins. If P&G is willing to accept 50% of their new product ideas from outside the firm, then perhaps we should all start crowdsourcing at some level. The real value in creativity and innovation is in identifying the opportunities and emerging threats and moving to a new place before others do. Asking people to help identify the ideas based on a specific opportunity or strategy we've developed, and having the wherewithal to select and implement the best ideas is where the value is added. This isn't to denigrate the people who submit ideas or designs, but they are only fulfilling one step of a much broader process, in the context that we've set, for outcomes and purposes that we've determined. There's a great deal of value to be tapped in crowds and crowdsourcing, but as the Dell folks can tell you, 15,000 ideas later, the real magic is in understanding which ones to choose and having the skill to implement the right ones. That's where the real value in innovation or creativity lies. Well, Scott Berkun beat me to it, so go read his article The Secret about Innovation Secrets and then come back here for the rest of the story. Go ahead. I'll wait. You're back? Good. And a bit disappointed, I'm sure. Well, I'm not here to debate any of the points that Scott made. If you were hoping that there is a "secret formula" for innovation success, you were wrong. But you knew that anyway, deep down inside. Anything worth anything requires work and investment. No, the dirty secret about innovation is that there aren't any secrets. There's no magic formula, there's no "one best way". As Edison said, often opportunity is missed by most people because it wears overalls and comes disguised as work. The same is true of innovation. Berkun's best points come at the end, when he says that innovation is taking a bet against the unknown. Innovation should be about creating something new. In most businesses that are optimized for sustaining existing products and services, creating something new requires two difficult tasks - diverting resources from products and services that are already "successful" at some level, and developing something completely new, often in a new market segment or targeting a new customer segment. So, the work involves taking resources from a known entity and investing in an uncertain one. Most firms would rather double down on the known entity, even if the returns haven't been what were expected, rather than invest in an uncertain outcome. Another point I made by quoting Edison is that there's no secret formula to escape the "work" of innovation. If, like Edison, or many other innovators, you are to succeed at innovation, then you'll need to be prepared to actually, you know, WORK at it. This means you'll have to spot opportunities well in advance of your competitors, generate ideas, develop the ideas, test and prototype the ideas, and hopefully launch something new. Edison's quip about knowing a thousand ways not to make a lightbulb is aprocryphal but also true - his team invested years testing a range of different filaments, all in the quest to create a viable electric light bulb. That took investment and real work. There's simply no escaping that fact. When you add these two facts together - an uncertain investment into the unknown combined with a significant amount of actual new work - it's little wonder that many firms shy away from innovation, or skip along the surface rather than diving deeply. This isn't a commitment to be taken half-heartedly or lightly, and many firms that have attempted and "failed" at innovation simply weren't truly committed. It wasn't as if their people lacked ideas or lacked the capabilities for innovation - the firms weren't truly aware or invested in the innovation effort. And that's the real secret about innovation. Firms that are successful are down and dirty, doing innovation work regularly and fully committed to innovation success. There's no magic formula, and Steve Jobs and the guys at Google aren't that much smarter or more innovative, just more committed. I was listening today to a story about the demise of Tower Records. At one time Tower Records was the place to find new music. The stores were jammed with CDs and knowledgeable clerks who could turn you on to new music. The story said that Tower was damaged by the ability to download music, but interestingly also pointed out that two-thirds of all music bought in 2009 was on a CD format. Tower closed in 2006, so most likely the proportion of music sold on CDs was even higher then. What happened to Tower? Is it possible to draw conclusions on the failure of Tower Records about innovation? The radio article concluded that as Tower expanded, it wasn't able to attract and retain passionate employees who cared about music. This is one of the aspects of Tower Records that made it unique. As Tower Records lost the ability to create an interesting "place" for people who loved music, it began to compete with the Big Box stores. Why seek out a Tower Records if you can get a lower price at Big Box store? The reason that people went to Tower was for the insights, the community and the selection. Take away some of those features and Tower seemed a big stale, and overpriced. Tower lost a sense of passion about music, and with that it lost a sense of "place". Then, its purpose was less obvious. When these factors, passion, purpose and place, became fuzzy or were simply abandoned, Tower Records had no real distinction over the music section at Wal-Mart. After all, what differentiates a commodity? Music on CDs is a commodity, and Wal-Mart and the Big Box stores are good at inventory management and cost reduction. But try to find someone at the Wal-Mart music section who knows the difference between the Whigs and the Afghan Whigs. Innovators, too, need these factors to succeed. When innovators have a specific purpose, their work is aligned with the needs of the organization, and is in synch with corporate strategy. When innovation isn't in alignment with an organization's needs and goals, it seems mindless and lacks value. A clearly stated purpose for innovation is crucial, and without it innovators will struggle. I've written previously about the need for passionate people in an innovation effort. Simply lining up a team and pointing them to a necessary goal may work for many corporate initiatives, but it won't for innovation. There are simply too many challenges and risks associated with innovation. Innovation needs passionate, committed people who have a clear purpose. Finally, innovation will succeed when it has a "place". This term is a bit trickier to define. In the case of Tower Records, "place" meant community - you knew that music was valued and appreciated, and you'd interact with others who had the same insights and interests at Tower. From an innovation point of view, a "place" can be a physical location - an innovation lab, where people are encouraged to think creatively. It could be a virtual place using software to encourage interaction, like Dell's IdeaStorm site. Or "place" could suggest a community or social networking site to encourage innovators to interact. Regardless, what is important is the ability to mix and mingle with people who share a common goal, methods and philosophy. If these three factors - a clear purpose, passionate people and a sense of place - are available for an innovation team, then the chances of success are much greater. If any of these aren't available, then innovation will lag, since all of the ingredients are important. Passionate people with a purpose still need physical and virtual "places. Passionate people with a "place" need a clear purpose. And few innovations are ever launched by people who lack passion, regardless of their purpose or place. After all I read on the blogs and on Twitter, and all the new innovation programs and initiatives in state and local governments, I feel the need to revisit the definitions of these key words. While innovation, invention and entrepreneurs are important and somewhat interconnected, they aren't synonyms and they have different needs, intents and purposes. Whether accidently or on purpose, we can't allow them to mean the same things. An entrepreneur is a person who starts a new business. That's not necessarily innovative, but it can create new jobs and new wealth, so it is valuable. Sometimes, entrepreneurs create new businesses based on new ideas, either inventions or new innovations. However, a person running a McDonald's is also an entrepreneur, but not necessarily innovative. An inventor is someone who creates a new to the world product or solution. Inventions become interesting when they create value for the inventor or consumers or the world at large. Inventors are often innovative, but innovative solutions don't have to be inventions. Many innovations are new business models, new services or new experiences that aren't necessarily "inventions". An innovation is a new idea that is put into valuable or profitable action. An innovation can be created by an inventor who then licenses her invention to others to commercialize, or commercializes the concept herself as a small business person - in this case as an entrepreneur. 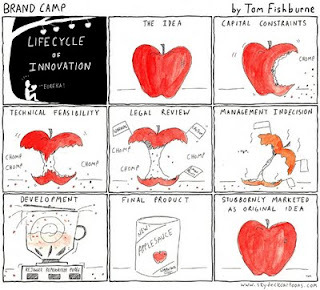 An innovation can (and often is) created by a large organization to disrupt an existing market space or create an entirely new market (the iPod or Flip Video recorder are two good examples). Innovation can happen in any organization, of any size. Additionally, there's innovation in governments, in academic institutions, and in not-for-profits. We typically don't think of these organizations as entrepreneurial or as inventing new things, yet they can be innovative. Further, innovations can be new products, but can also be new service models, new business models and new customer experiences. The reasons the distinctions are important are hopefully obvious. There are a number of state governments, as well as the federal government talking about innovation policy. Read the fine print and they are really talking about funding and sponsoring entrepreneurs and technology transfer from institutions and universities. This may have some aspect of innovation, but doesn't really consider organizations outside the start-up realm. A vast majority of disruptive and incremental innovations come from larger, commercial organizations, and these organizations can become more innovative as governments adjust tax policies, intellectual property rights and a number of other components of regulation and legislation. Yet most of the state and federal initiatives are really targeted at starting and funding new entrepreneurs and small businesses. Interestingly, if you stop to consider the most "innovative" locations in the US (Boston, Research Triangle Park, Austin, Silicon Valley as a few) you'll note that they have all three things in common - government, education and technology are closely linked and vital to all of these cities. Innovation thrives in an interlinked, internetworked community. The same isn't necessarily true of inventions or entrepreneurs. The overwhelming focus as well is on product innovation, yet we see consistently that business model innovation and customer experience innovation are much more compelling. After all, the icon of innovation, the iPod, is simply another MP-3 player unless iTunes is attached. It was the radical change in the business model and customer experience that made the iPod a true disrupter. Yet we don't find too much focus or government initiatives in these areas. And almost no policy or funding for the organizations that need innovation the most - governments and educational institutions and bureaucracies. Another thing - having been a founder in a start-up, most entrepreneurs don't need or want a lot of help from an "innovation" perspective. They are betting the farm on their one great idea. For them, its all a matter of execution to bring that one idea to life, and then successfully scaling that idea. In contrast, larger organizations which have lost the passion and initiative of the entrepreneurs need a great deal of help and encouragement to innovate, since they have much to lose if a new product or service fails. In larger firms there is almost never a shortage of ideas, but a shortage of risk-taking, passion and resources to develop the new idea. Interesting that the problem the small firms have (scaling) is one the larger firms can offer, and the challenge the larger firms have (risk-taking, passion) is one the smaller firms can offer. We need all three of these concepts work well to succeed. We need inventors to create new products and new processes, and we need entrepreneurs to disrupt existing markets and bring these new products and services to the market. We also need innovation from large existing firms, because without innovation they stagnate and die. When we talk about innovation, invention and entrepreneurs, and when we put policies in place to encourage certain types of activities or investments, we need to understand the implications and ramifications of those words and actions. While closely related, invention, innovation and entrepreneurs are not the same things, and should not be treated in the same fashion. OK I made up the number. But lately it seems on Twitter and Facebook and other social media sites people are claiming "N" number of ways to innovate. That may be true. There may, in fact, be an infinite number of tools and techniques to help you innovate. But we miss the most important number: 1. Most people simply need one way to innovate, and talking about hundreds of ways is missing the point. Many of us who write and think about innovation are at risk of becoming fanboys - so caught up in the aura and the technology that we start to argue arcane issues, like the number of innovators that can dance on the head of a pin. What we miss is that many people don't get to innovate at all, or don't know where to start. For those people, offering hundreds of options is offering no options. For those just about to start, let's simplify things by providing them one or two sets of tools or techniques that aren't simply thought starters or new perspectives, but give them a set of tools or methods so they can create, evaluate and launch a new idea as a new product or service. That's innovation. I fear we make innovation too complicated when we are trying to explain how simple and easy it can be. By claiming so many different tools and techniques, we cloud the issue that any innovator really only needs to grasp one tools or method and have the guts to use that tool to its logical conclusion. If we present such a range of tools without context then the new innovator is left trying to decide which one is "right" for him and his circumstances. If that tool doesn't get the job done, was it a selection problem? Was it an execution problem? Faced with many alternative options and no clear winner, many people will choose not to choose. We innovators need to be careful when we talk and write about innovation, especially when we talk about tools and options. Most people need a very small set of tools carefully applied over a period of time to be successful. If we simply present them with the smorgasbord of all possible tools, without context or a sense of when each tool is practical and successful, we've only made the decision to innovate more difficult, not less. In trying to reduce the mythology, we've actually enhanced it. Sure, there are probably a thousand ways to innovate, but remember most people only need one good one. I've been thinking a lot lately about "creating a culture of innovation", which is what a lot of firms suggest they want to do. Of course this is a very lofty goal. Changing a corporate culture doesn't happen easily, and it certainly doesn't happen overnight. Yet clearly one of the most significant barriers to innovation is the entrenched culture of effectiveness and efficiency, of risk-avoidance and following rather than leading. So, that led me to think about when teams and groups within an organization can be innovative, and what the conditions were when that happened. We regularly lead teams on trend spotting and scenario planning exercises that create some really radical future scenarios, with little resistance, and often lead ideation and brainstorming programs that achieve a large number of disruptive or radical ideas. These small programs demonstrate that innovation can happen in any organization under certain conditions. Let's first look at what makes these small programs effective. We find that we can be most effective with these discovery and idea generation programs when we set very clear expectations about our goals and prepare the team carefully for the work, setting out specific rules and expectations. Typically when we go into the work, we'll close the door and tell the team that anything that happens in the room is fair game, and open for discussion, and we aren't bound by the "normal" rules. This helps get the team out of the "day to day" thinking and encourage their creative thinking. They know that no one will be allowed to ridicule an idea or submit challenges that will block the consideration of an idea. For those few moments or days, we have created a "micro-climate" for innovation, probably akin to a hothouse in the wintertime. So, if we can create some assorted micro-climates where teams can spot opportunities and emerging trends, and effectively generate ideas, can we build on the "micro-climate" concept to create more areas where conditions are ripe for innovation? Using the flower analogy, can we move the ideas from one hothouse to another, gradually exposing the ideas to the elements and improving the chances for survival, while we try to change the conditions of the organization at large (change the cultural attitudes to innovation)? I'd like to suggest the first step may be to create a number of "micro-climates" - safe locations to generate, develop and evaluate ideas that exist specifically to give ideas the necessary environments to grow. Some firms use a designated space for innovation. Perhaps the best way to change the culture is to start small, with several micro-climates that establish conditions for innovation and allow the process to prove its worth. Eventually the idea needs to be exposed to the conditions, and planted where it will bear fruit. That is, it must make a transition from an interesting idea to a new product or service, and that means it must work its way through the product or service development process. There are two considerations here: either the existing product or service development process must be adjusted to accept and manage new, possibly more disruptive and fragile concepts, or new product and service development models must be developed for more radical ideas. To carry the plant analogy further, any farmer worth his salt will cover plants in the field that are susceptible to a killing frost or unexpected conditions. So, too, must an organization provide more cover and care for a radical idea as it moves through a traditional product development process. The point here is that too many times we talk about "changing the culture" and immediately reject the concept, since it is such a Herculean task. Perhaps what we should do is establish small teams and locations where the conditions are beneficial to innovation - small micro-climates where ideas can succeed, and string them together. Once we've demonstrated success, we won't have to worry about changing the culture, because slowly the organization will recognize success and begin to adapt to the best concepts that the conditions in the micro-climates offer them. I guess my kids are just too old for crayons anymore, so I missed the CrayonMaker when it was first released, but I'd like to use it as an example of understanding customer needs and identifying lead users, and how an innovation can open up an entirely new market space and revenue opportunity. For years kids have had broken crayons and their parents have melted them down and formed new crayons, often by mixing the broken pieces. My wife did this for our kids just a few years ago using a muffin tin in the oven. I'm going to guess that Crayola was aware of this activity, neither encouraging or discouraging the activity, until 2003, when it released the Crayon Maker, a machine that allows kids to melt down their crayons and create new ones. Now, crayons have been with us quite a while, and parents have been melting down the broken pieces for quite a while. What took Crayola so long to respond to these lead users who were creating their own crayons? But let's push through the existing Crayon Maker and think about the opportunities for new innovation. Right now Crayola is only positioning the Crayon Maker to melt down old, broken Crayons. Why not offer Crayon Shavings or Crayon Bits, built specifically for melting down? These would probably be cheaper to produce, and Crayola could probably charge more for them, giving kids two activities - making crayons and using the crayons. Next, why not let kids make Crayons in different shapes? Right now the Crayon Maker makes Crayons in the same shape as they come out of the box. Creating forms or molds in different shapes wouldn't be difficult and could be more fun for kids. Next, why not sell dies or additives that let kids make their own crayon colors? You could turn the creation of crayons into a science experiment, allowing kids to create their own colors, textures and perhaps even scented crayons. Simply by creating a machine that allows kids to create new crayons we can open up a lot of other product and service offerings. What's taking you so long, Crayola? These examples are simply thought exercises that indicate how innovation should work. A customer need or lead user is identified, a new product or services is delivered and it opens up an entirely new market opportunity. What customer insights are hiding in plain sight in your business? What lead users are creating products and services to simplify their lives based on your products or information? Think this doesn't happen in the "real world" of adults? Check out Mint.com, which is taking the financial world by storm. Mint simply helps individuals consolidate a view of their financial lives online. What we've been doing in spreadsheets is now done automatically for us by Mint. Why didn't the banks see this opportunity? What new products and services could a Mint create by offering a consolidated view of your financials? It's important to interact with your customers and understand what they are doing and creating to improve your products. Sometimes you may discover customers who have created entirely new products or solutions based on your existing products. These lead users often point the way for new product or service development. Once that new product or service is developed, it can open an entirely new market for your firm. Typically one of the most significant strategic challenges for any innovation effort has to do with goals. When executives ask their teams to "be more innovative" it's often unclear how innovative and what the ultimate goals for innovation should be. Since the natural inclination in most firms is to be cautious, this means that the goals for innovation are often set very low, which can result in incremental innovation. Successful innovation programs usually have very well defined and specific goals set by executives and carefully measured. A good example of an innovation goal set by a government that's had real impact was reported on last night (December 7) by Marketplace. The story was nominally about energy usage in Japan, which imports almost all of its energy sources. After the oil shocks of the 1970s, the Japanese government created a number of new rules about energy usage. These rules also imposed new requirements on manufacturers and their products. Probably the most interesting to me were these two rules: first, manufacturing companies had to become 1% more efficient in their use of energy each year, and second, any product they introduced had to be at least as efficient as the most efficient product in the market. These mandated goals forced Japanese industry to consider how they use energy, as well as how to create products that were compelling for the consumer but also met strict energy usage requirements. In the story, an executive from a firm notes that the rules were at first onerous, but the firm recognized that they should view the energy rules as a means of innovation. Imagine what would have happened in the US automotive industry if the government had simply stipulated that every vehicle that was introduced had to be at least as efficient as one it replaced, or that every three years the average fuel efficiency had to increase 5%. Small, continuous increases in these expected goals would lead to more innovation, not less, and achieve other social goods as well. A reasonable step-wise increase year on year forces firms to innovate and would probably create better products. How can ideas like this translate into an innovation effort in a company? Perhaps we should set innovation goals as continuous goals over longer periods of time, and make them continuous but incremental. For example Ford or GM could set a goal of a 3% increase year on year for fuel efficiency, or health care firms could set a 1% increase in the number of people covered year on year with no change in costs. Real, radical innovation happens when people are forced to change. The Japanese had no other alternative when the oil shocks happened since they rely on imported energy. Innovation works more effectively when there is a top down, organizational commitment to innovation. In the case of Japan this started in the prime ministers office. Sustained innovation becomes part of the fabric of the culture. In the article, the interviewer notes that the family he visits keeps the thermostat low, uses high efficiency appliances and re-uses bath water (didn't need to know that one). The business people they interview note that the restrictions have made the industries more innovative. Setting clear, distinct goals helps communicate the kinds of innovation necessary. Sustained, continuous goals demonstrate the need for innovation over time. What distinct, measurable goals does your firm set for its innovation efforts? Are they sustained, continuous goals over a long period of time, or are they very short term, discrete goals? These goals, and how you communicate them, dictate the kind of innovation your firm will achieve. I'm a sports fan, and as such I've managed to learn a number of theories about winning and losing. One of my favorite theories is the "chip away" concept. This is the hallowed method for a team on the wrong side of the score to catch up and win the game. The concept the coach focuses on is that his or her team musn't try to catch up too quickly. Rather, they should carefully and methodically "chip away" the other team's lead until they are within striking distance. In this manner the team can break down the opposing team's lead over the remainder of the game and slowly, methodically pull closer and then pull ahead. I'd like to submit to you that most organizations have a "chip away" theory about innovation and new product development as well, and that chip away theory is in large part why 1) your team needs to consider wild ideas and 2) why most of the "innovation" your company manages to accomplish seems so mundane. The corporate chip away theory works very differently than the sports analogy. In most organizations, if a really interesting or insightful idea is created, the "chip away" process begins to remove the rough edges, the interesting concepts and radical thoughts by imposing corporate expectations, safety considerations, brand requirements, channel restrictions, and so forth. Eventually, what was an interesting, insightful idea has been chipped away to become a safe, sensible idea that seems pretty much the same as all the other existing products or services. Unlike our sports analogy, there's no coach advocating the chip away methodology - this process occurs naturally in any organization as turf is defended, existing products protected and change is avoided. It is in the nature of the bureaucracy to chip away and normalize any new idea, which is why really radical innovation is such a hothouse flower. Anyone, from any team or business function, is usually welcome to chip away at ideas. This is also why many truly innovative ideas come from skunkworks, which defend the team and the ideas from the corporate antibodies. There's really two points to my diatribe about the corporate chip away of interesting ideas. The first is - you may as well generate radical ideas, because the chip away theory guarantees that any idea will be significantly downgraded by the time it is commercialized. Starting with an incremental idea, that idea will be rapidly transformed into a safe, standard product or service. Starting with a more radical idea, you may find that some of the innovative features or concepts remain after the chip away has occurred. The second point is that anything your innovation team can do to moderate or eliminate the chip away philosophy, the better for your innovations and for your long term viability. No one intentionally chips away at ideas - the actions are just part of the corporate culture and environment. Changing the culture from an inherently careful, cautious model to one that embraces change and innovation can reduce the chip away process. To accomplish that you'll need involved management, consistent communication and a new risk/reward mentality. The cartoon below says it much better than I can - perhaps proving that a picture is worth a thousand words. Last year in an effort to be provocative, Bruce Nussbaum of BusinessWeek proclaimed that innovation was "dead". That elicited the usual outcry and defense of innovation, from yours truly and others. Bruce wasn't really trying to argue that innovation was dead. I believe he was trying to help us gain perspective on what innovation is - and what it isn't. Lately I've been reading a number of articles and blog posts that state that brainstorming is, well, dead. I guess innovators should probably have a deeper vocabulary or at least access to a thesaurus. When someone, anyone, claims a technique or school of thought is "dead", then we should begin by asking for the rationale or proof. Does the individual making the claim have insight the rest of us don't have? Does the individual have a vested interest in the death of the technique or tool? Is it possible that the tool isn't really dead, just poorly applied? Let's evaluate the vital signs of brainstorming and determine whether there is life left in the corpse. Let's first stipulate that brainstorming is probably the most popular and most commonly used idea generation technique in a group. Not to say that all brainstorms are effective, but that many people have a general understanding about the technique and its usefulness for the purpose. If brainstorming were indeed dead as a technique, would innovation firms continue to use it? Would firms that offer innovation continue to train clients on the technique? Clearly, effective brainstorming hasn't passed its prime, since I personally have seen it used successfully in the last few weeks. I suspect others of you have as well. What, then, drives the notion among some of the innovation cognoscenti that brainstorming is "dead". Well, there is an interest in introducing new, more exotic tools. Tools like SIT, TRIZ, SCAMPER and a host of other new techniques promise improved idea generation. In fact some of these techniques work well, and some can be used to drive discussion within a brainstorming exercise. While these tools and techniques are useful, they complement, not replace, brainstorming. Could it be that many organizations aren't using brainstorming successfully? There are a number of factors and attributes of a successful brainstorming session. The difference between a good brainstorming session and a poor one is very similar to the differences between a good presentation and a poor presentation: a clear agenda, well defined goals, a tight scope, defined outcomes and clear roles. If these factors don't exist, then a brainstorm won't work well, but then again neither will any other idea generation technique. When you're the leader, every other claimant to the throne is seeking to knock you off. While brainstorming is not without its faults, none of the other idea generation techniques are complete replacements nor are they without their biases and faults. Finally, what we all need to realize is that brainstorming is simply a technique or tool to generate ideas that has its place in a larger innovation process. For me to say that brainstorming is dead is akin to saying that since the crescent wrench is missing from the toolbox, we can't fix the sink. Brainstorming is a tool that provides solutions in a larger framework, and can in some instances be replaced with other tools that produce similar outcomes in line with our process expectations. However, there's no compelling reason to throw the brainstorm technique out with the bathwater. More probably, there's a need to train more people to use the tool more effectively, more often. Paraphrasing Faulkner, brainstorming isn't dead, it's not even passed. There's life in the corpse, and by using the tools and techniques correctly and in the right settings, it has tremendous value. Be careful when anyone tells you that a technique as ubiquitous as brainstorming is somehow dead. They've placed far too much emphasis on a tool, and far too little emphasis on the overall innovation process. There are few other business initiatives that rely as heavily on the "right" people as an innovation initiative. That's because unlike most other work in an organization, innovation is risky, uncertain, poorly defined and at odds with most of the rest of the work of the organization. Since there are no processes or methodologies, people play a much more significant role, and an innovation initiative will often live or die by the people who participate. Given that, it's somewhat surprising to me how little thought is given to who is on the innovation team. In many instances when I quiz our clients about how a team was put together, we find out that many of the people on the team were assigned. You know how this works - management dictates a head tax of one person per product group or business function, and the executives scramble to find out who is 1)available and 2) won't embarrass them, not who is the best candidate for the role. The best people are reserved for key projects already underway. So, many innovation teams are made up of people who aren't necessarily the best innovators and who often were unwilling participants. Innovation teams should be made up of VOLUNTEERS who are completely committed to the concept. If the work is going to be difficult and risky, I would at least like to know that the people on the team want to be there and want to make a difference. I want people who are ENGAGED, not assigned and who want to create change. I don't care as much about experience as I do PASSION, since when all else fails it will be the desire and passion that pushes through the barriers. I am interested in RULE BREAKERS, not rule takers. People who accept the rules as stated (or unstated in a culture) will not effect great change. I want people on the team who are willing to go the extra mile, since innovation will always require more work than their current job. Nine to fivers will find it difficult. I want people who are comfortable with ambiguity, since innovation often works outside the lines of black and white, in the gray areas where there are no templates. People who are too comfortable with either/or propositions aren't successful innovators. Additionally I want people who understand that innovation is as much about learning as it is about creating, so they understand that the ideas will occasionally fail. I need people on the innovation team to be willing to discover what's great about an idea rather than what's wrong with it. I need the first words out of their mouths to be "What if" rather than "But". I want people who don't care how we did it before, or whether the idea has been considered before. I want people who look for opportunities for success rather than reasons not to try. Finally, I want a balanced team. I've written before about concepts like KAI and the FourSight model, but a recent training exercise brought this home. In the training I felt the team was not engaged, until we started working on the skills necesary for idea generation, evaluation and prototyping, when the team seemed much more engaged. Once again this brought home the fact that some people are synthesizers, some ideators and some developers. Understanding the preferences and skills and balancing those skills on the team is vital. The Foursight model does a good job of helping you understand each person's predilection, which can help you balance the team. Everyone can participate in an innovation effort, given the appropriate mindsets (see above) and everyone has a different range of interests and skills. Building a team with five ideators and no developers is dangerous because the team will be biased toward generating ideas but may never actually develop anything. Let's look at this another way. If you were planning to scale a mountain, you'd recruit people you knew had the skills to climb the mountain and consider what each person brought to the team. You'd remind them of the challenges and the dangers and ask anyone who had doubts or concerns to leave. You'd look for a good balance of skills and capabilities and experiences. You'd leave anyone behind who was doubtful of the outcome. In other words, you'd recruit and build a team that was more likely to be successful from the start. Why would you do anything less when building an innovation team? If innovation is critical for your business, and if it is a high-stakes activity, then why wouldn't you build the team in exactly the same way? There's an old saying that some people are born to greatness and others have it thrust upon them. Don't allow just anyone to be thrust upon you in your innovation team. Set high expectations and recruit the best people - in fact, have them apply to be part of the team. There's an interesting and difficult conundrum associated with innovation based on the calendars and timeframes of most organizations. While many organizations want innovation, they are not able to innovate beyond their "headlights", which to me means the span of time into the future they are willing to investigate. Most businesses operate in approximately three timeframes: the quarter, the annual plan, and timeframes beyond one year out. These timeframes are dictated by the financial markets, not by any specific ebb and flow of business, and these time frames don't align to or account for the interworkings of the organizations. The first timeframe, 90 days, is dictated especially to publicly traded firms. However, any firm of any size will frankly tell you that little can be changed in a quarter. The next time frame is the fiscal year, which is dictated again by the financial community. Note that neither of these timeframes has anything to do with the internal workings or operations of the business, especially when it comes to innovation. If we are honest with ourselves, we'll be willing to admit there are at least three phases of innovation and new product development: idea generation and selection, new product development and commercialization and launch. In most organizations new product development and commercialization will rarely take less than 18 months to two years. Adding in the timeframe to identify opportunities and generate ideas, it's easy to see that an idea generated today in most firms won't be commercialized in less than 2 to 2.5 years. This is where the concept of innovating beyond the headlights comes into play. If we have an idea to product or service lifecycle of 2 to 2.5 years, then we need a planning cycle and an investigation cycle of at least that length, if not more. If the business is not identifying opportunities 3 to 5 years in the future and has a idea to product lifecycle of 2 to 2.5 years, then it's almost impossible for the firm to ever create a truly disruptive product, since it's development time is longer than its runway. It's not as if we compete in a market that has no other insightful, aggressive competitors and new entrants. Consumers aren't simply going to wait for your firm to unveil products and services that have already been launched by competitors. No, innovators need to identify opportunities that are further into the future, and that will cause consternation by many of the individuals tied to the quarterly plan or the yearly plan. Innovators need to push their visions at least three to five years into the future to identify emerging opportunities or needs, and begin to develop products and services to meet those needs. Given the elapsed time to bring a new product to market, even a three year planning horizon is probably too short. Forecasting opportunities that are less than two years into the future doesn't account for the internal development processes or the ability of competitors or disrupters to enter the market. Even incremental innovation is timeconsuming, so we may as well swing for the fences on a regular basis. If these postulates hold true, then there are two conclusions. First, we need to make our idea to product or service launch process more compact and more efficient, so that we can identify opportunities and launch new products and services faster. In addition, we need to extend our trend spotting and scenario planning further into the future, to understand opportunities and provide enough runway so that we can create compelling and unique offerings and solutions as the market becomes aware of the needs.